Linda from Koka Quilts and I decided that we needed a regular blog link up, to share WIPS and finishes. 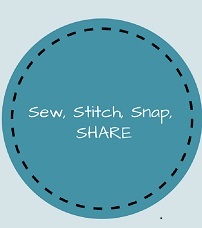 So we have created Sew, Stitch, Snap Share - basically sew and/or stitch each week, snap a photo or three and share it to our link which we will co-host fortnightly on Wednesdays. You can write as much or as little about your project as you like. 1. Link up any post from the past week that features something you have been Sewing or Stitching. 2. Somewhere in your post, please link to this post. 3. Comment on at least a few of the other Sew, Stitch, Snap, Share links - it's fun to receive comments from new people, and we are trying to encourage people to read and keep blogging too. Linda and I have decided to share the commenting your linked posts, so as long as you aren't a no-reply blogger you will hear from either of us.